Here are images of four related chassis. I believe all four are based on a chassis from the manufacturer International. 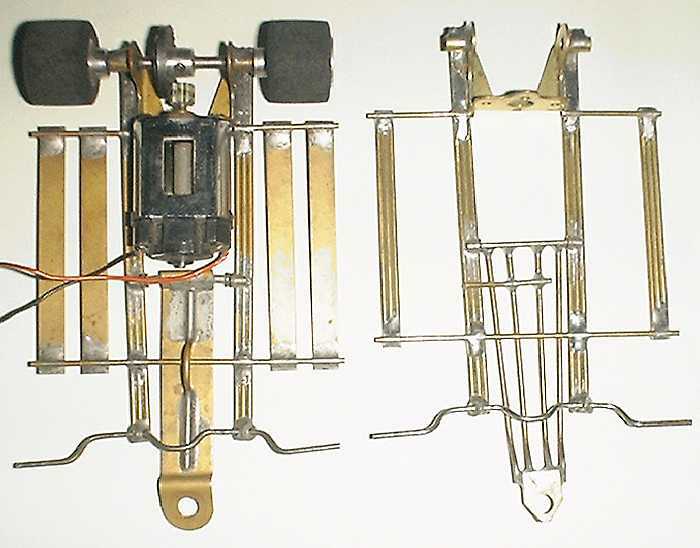 The first chassis, 'a' on the left, I can definitely identify as a 1220-A International 16D Strip Chassis, as seen on page 166 of the Auto World catalog, 1969. It matches the picture exactly, even the 'inchworm' drop arm stop. The AW ad lists rigid and hinged 'floppy' body mounts; this has the rigid body mounts. The AW ad lists 16D and 26D motor brackets; this is the 16D. The AW ad states that the chassis is now sold with a solid 1/8" front axle instead of the curved 1/16" drop center front axle; this is the 1/16" axle. I don't know what other chassis International made, as distinguished from those modified by their owners. Let's keep on the lookout for other examples. 1. All four chassis have the same 3 rail construction of the center section. 2. 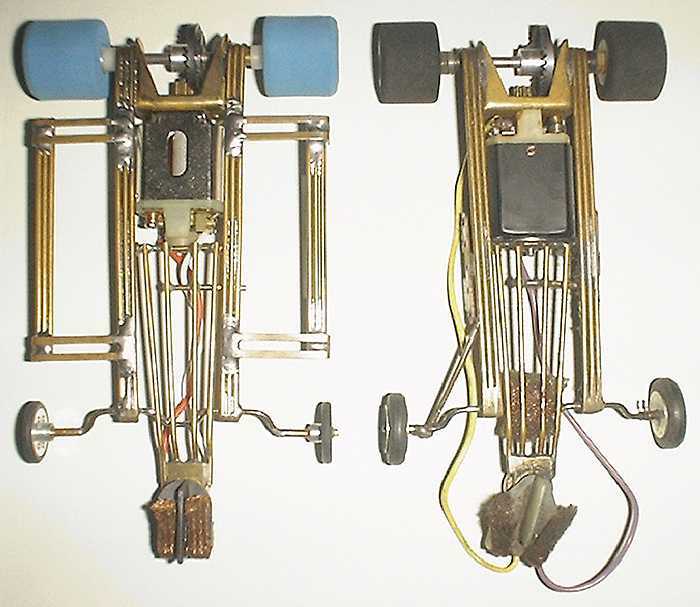 All four chassis have the same inline motor bracket. all 4 chassis are broken at this same point, so the axle rotates! NEW! See detailed pictures of this joint here! 4. All four chassis have the same connection from the drop arm to the main rails, with a little stovepipe hat on each end of the crossbar! 5. 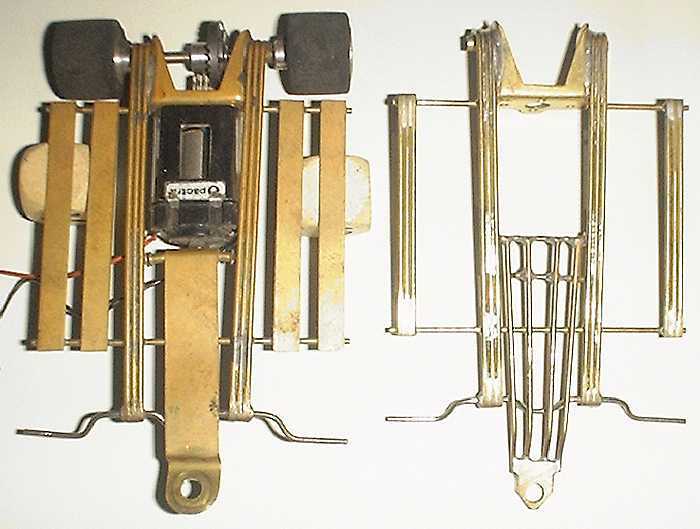 All four chassis show rough grinding of the main rails, on bottom, under front axle connection. 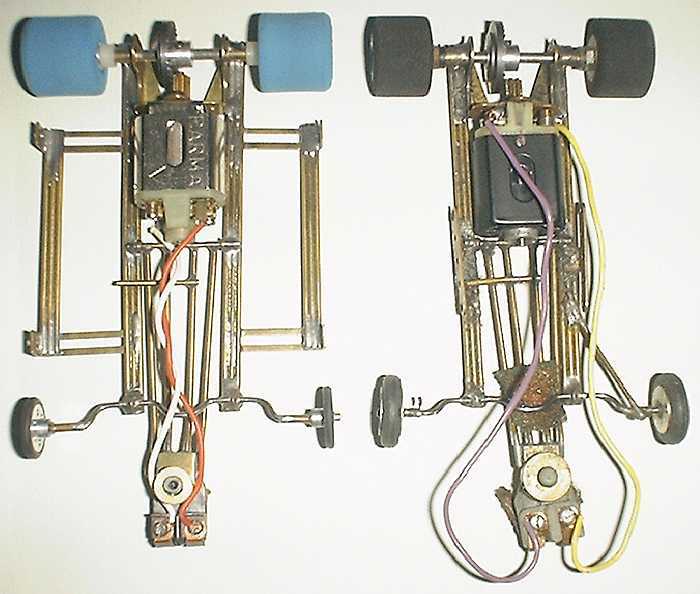 6. a and b have the same pin tube body mounts. 7. b, c and d have same drop arm and same guide flag holder (which, in turn, looks like a Dynamic scratchbuilder's part). 8. b and c are plated with something shiny, while a and d are brass wire with a nicely aged patina. 9. Speculation: b and c - chop chop! Notice that the outer rails, by the body mounts, are shiny 3-wire assemblies, that look exactly like the inner frame rails. I wonder if someone (maybe at International?) chopped up another International chassis and mounted the rails on the outside of these 2 chassis? Notice b and c have different ways to make this same connection (pin tubes vs. L-brackets). Maybe inspired by a magazine article? 10. Final questions: Were all four chassis made by International? Surely. Were b, c and d modified by their owners? Surely. But which differences in the four are due to International, and which differences are due to their owners? That's the hard question! There is a new details page about the front axle joint.